Are you an adventurous eater? I’d love to know where you fall on that spectrum. Maybe someday I’ll put together a survey since the wondering keeps me up at night. For now, I’m going to put faith in my readers; that you trust my judgment and know I won’t lead you astray. Granted, many of you probably see this as an every day meal (satay! bring it on!) but I’m sure there are others who have never had satay (or even heard of it) and might be a little skeptical. Take my hand. You can trust me here. Promise. 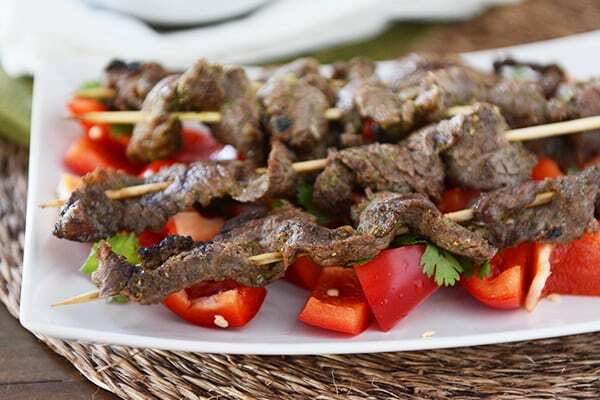 In really basic terms, satay is grilled meat skewers with an Asian flair (often Thai-style) and they are usually served with some type of peanut sauce. When I posted this easy, 5-minute blender peanut sauce a couple months ago, I was dreaming of satay. It’s a super easy dish that absolutely screams in your face with flavor. And I’m not kidding when I say it takes minutes to prepare. This beef version is so fantastic. Lightly spiced in a simple marinade, the tender, juicy flank steak is perfect with the creamy, sweet, and spicy peanut sauce. And while I haven’t tried it, I’m guessing the marinade would work equally well on chicken. In this family where adventurous eating is praised (my tagline to the kids is always: “I’m not raising picky eaters”) but not always embraced with joy, this meal was very well-received. Like, no raised eyebrows or skeptical looks at all. Awesome. 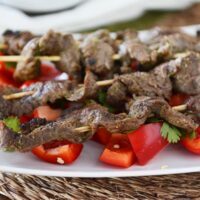 Three of the five kids went all in – satay and loads of peanut dipping sauce and bits of red pepper hanging on here and there, while a couple others decided the flavorful meat was enough for them. Brian and I (and my mom who was visiting) of course enjoyed every little morsel. I think I might have even stabbed someone (I’d like to think unintentionally) with the dangerous pointy end of a skewer trying to nonchalantly get my hands on one of the last remaining pieces of satay. I suppose along with teaching my kids how to be adventurous eaters, I should probably throw some etiquette lessons in there. Ahem. For all of us, of course. In a food processor or blender, puree the lime juice, cilantro, garlic, ginger, brown sugar, fish sauce, soy sauce, chili garlic sauce (or sririacha) and sesame oil. Place the steak slices into a gallon-size ziploc bag or in a shallow dish and pour the marinade over the top of the meat. Refrigerate for at least an hour or up to 4 hours. 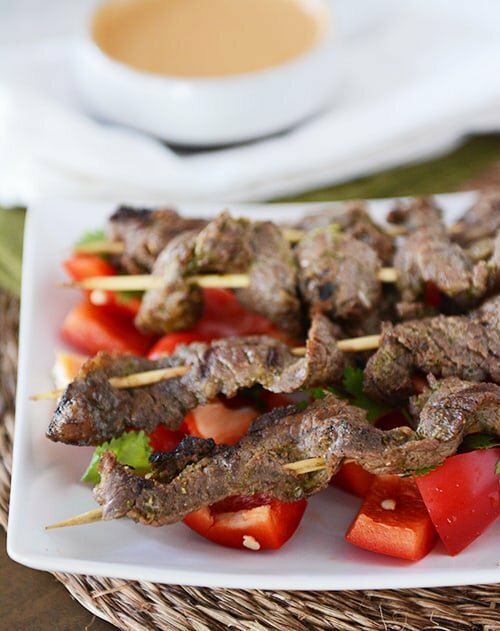 Thread the meat slices back and forth onto skewers (2-3 per skewer unless using shorter sticks). Preheat the grill to medium-high. Grill the satay skewers for 2-3 minutes per side (longer, if needed, depending on thickness of the meat). 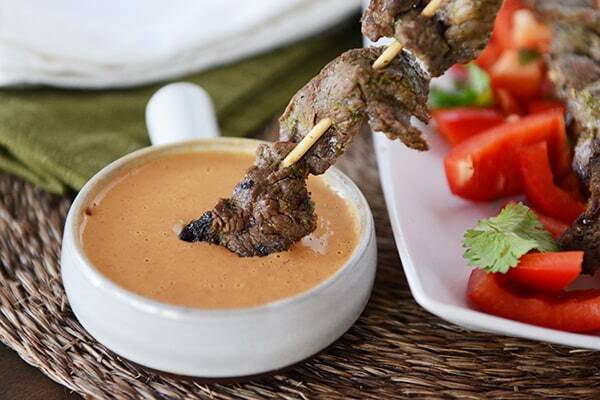 Garnish the satay with red peppers and cilantro, if desired, and serve with peanut dipping sauce. I use 11-inch bamboo skewers for this recipe. If I think about it ahead of time, I soak them in cool water for 15-20 minutes before using - helps so they don't burn on the grill. Next Post » Let’s Talk: All About Cookie Scoops + Lots of Other Uses! Mel, what brand of chili garlic sauce do you use for this recipe? I usually use Huy Fong. This was SO good!! That peanut sauce took it right up a notch! I just made this for the first time for dinner and I think what I said while eating was, “It’s like a festival of flavours in my mouth!” And my husband agreed. I made it with your 5-minute Thai peanut sauce, as recommended. Oh yum. Trying not to eat it out of the mason jar with a spoon. I served it with roast potatoes, red/yellow peppers on the skewers with the beef, and a cold veggie tray – they were so yum dipped in the peanut sauce too. An amazing meal. Thank you! I made these tonight with chicken and they were a hit! Huge hit! I only marinated for four hours and happened to NOT have cilantro in my fridge when I thought I did, and they still tasted awesome! My kids ate and ate and ate. I’m going to have to try this. On our trip to Ireland, we went to a Thai restaurant (that came highly recommended) and we ordered a beef satay for a appetizer. My husband served his mission in Thailand, so as we were dipping the yummy meat in the peanut sauce, I was asking him more about what he remembered about the food he ate on his mission. He actually mentioned he never had satay on his mission – and also commented that peanut sauce isn’t really a thing over there. And he ate out 3 meals a day for 2 years! He says the only time that he ever encountered peanuts at all was in Pad Thai where they served it with some crushed peanuts. Granted, he ate street food for those 2 years, and so I’m sure there’s more varied food in nicer restaurants, but it was interesting to me how different the American Thai food (or Irsh Thai food for that matter…) is from traditional or typical Thai food in Thailand. Nevertheless, the satay in this restaurant was super yum, and I’m excited to try out your recipe to make some at home! I made your Tikka Masala tonight, and it was delicious, and gobbled up by all 4 of my picky eaters. Which is a huge bonus. Thanks again! Super simple, light dinner. We cooked the meat on our Cuisinart Griddler, so no need to heat up our non-air conditioned NYC apartment. The peanut sauce wasn’t my favorite (for our taste it was to sweet, to thin, to mild, not enough acid), but I didn’t cook it, so tomorrow I am going to try simmering and then maybe tweaking, to mix with noodles and veggies for another quick supper. So I simmered the sauce and added a little extra soy sauce, lime juice, and sriracha and it was more to our taste. Delicious with noodles and veggies! And we’ve been drinking the Brazilian Lemonade like it is going out of style. So yummy, and a great combo with this beef. I am making the marinade on chicken tonight. I’ve used several kinds – a natural one from Costco and a Trader Joe’s natural. Oh sorry, I meant to address that to Wendy, who found the sauce a bit sweet. I was going to steer clear of her kind! Thanks, Mel! Thank you!! I love satay and my whole family of 6 all agreed it was amazing. I was a little worried about the fish sauce so I only used 1/2 tablespoon and added a tiny bit more soy sauce. I couldn’t taste it at all, so maybe I should have used the 1 tablespoon you suggested to others. We used chicken and steak and we loved them both. The peanut sauce was also soo good! I used cashew butter since we have a peanut allergy and it was still delicious. Mel, can you help a girl out with the fish sauce? I have only used it once, but the smell of it was so off-putting, and I felt like it was all we could taste in the final product. What am I missing??? Hi Gwen – I hear you on the fish sauce. The first couple times I used it, I agree that the smell was a little rattling. I guess I’ve gotten a bit used to it since I use a bit here and there in many of my Asian-style recipes. My suggestion if you feel like it overpowers the taste is to reduce it to half the amount. If you want to leave it completely out, try to up the soy sauce or add a bit more salt. Sounds amazing!!! I especially love that dipping sauce! YUM! As to the adventurous eater question…I will try at least 1 bite of almost anything. I can’t say that I’ve been offered anything super weird, though. I grew up in the Midwest in the 60’s with a mostly non-adventurous food except for some things from my Bulgarian Auntie on holidays. Then moved to California in my 20’s … on my own, and got to try a lot of different foods and was fortunate to have some mentors – particularly a man at the fish store that told me what he thought was best that day and also how to prepare it. And now, mostly here, but a few other spots on the www … I try things! I can’t wait to make this and the peanut sauce 🙂 Thanks for sharing! We are a family of adventurous eaters, especially when the recipes come from you! I love satay with peanut sauce. This looks absolutely delicious, Mel! I’m embarrassed to say, I have never heard of this. It has all my favorite things in it so it must be super amazingly delicious. Can’t wait to try it and love it and tell my friends all about it “you mean you’ve never heard of it? It’s to die for and so easy ” ha! Do you think it would be okay to leave out the fish sauce? Not a fish eater at all…. That would probably be fine – maybe add a touch more salt and maybe up the soy sauce just a bit. Flank is becoming so popular and pricy, it is hard to find in our stores. Would the work with flat iron steak? I think the sauce would be wonderful tossed with warmed zoodles. (Zucchini noodles) Love all your blog and recipes. Hi Jenice – yes, flank steak can be pricey if not on sale. Flat iron steak or skirt steak usually subs pretty well for flank. Only an adventurous eater when it is a Mel recipe. Otherwise, it is an expensive trial that often leads to a lot of disappointment. I was excited to see, after reading the recipe, that I have all these ingredients already from other Mel recipes. And you are right, I have never had satay. Thank you!